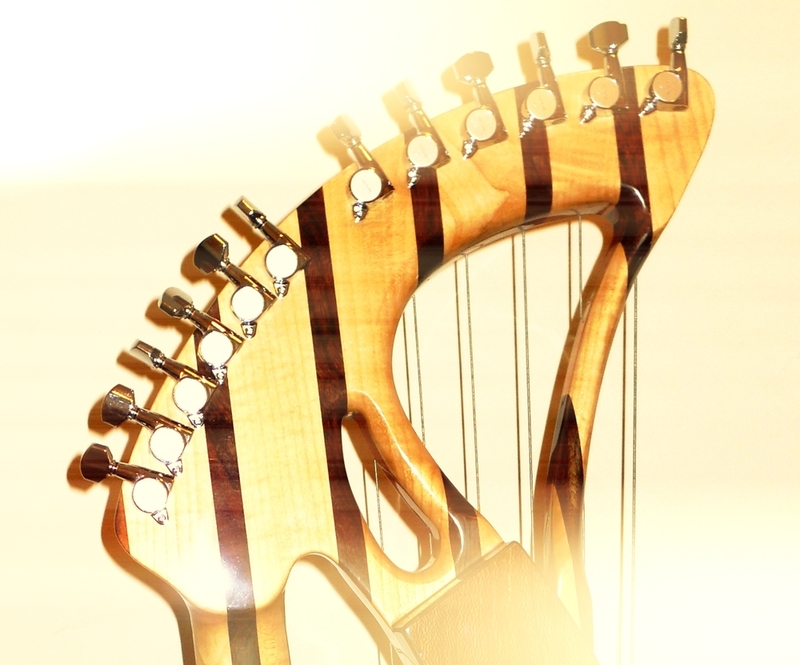 The basic idea for this Harp Guitar was conceived in November 2005 whilst sitting in an aircraft in Cologne, listening to Michael Hedges playing a Dyer harp guitar on my MP3 player. After making initial sketches and approximations, there followed 3 months of revisions, detail sketches, an MDF ergonomic test model and eventually a complete set of full size engineering drawings covering two 1200 x 900mm pages plus some additional detail drawings. I then went in search of a Luthier and was introduced to Nathan Sheppard who was at first very sceptical, but was eventually persuaded that it could work. At this point he suggested revisions to some to the joints, in particular the method of attaching the neck and headstock to the body. It was agreed that I would supply him with a detailed set of revised drawings and a complete body mould. 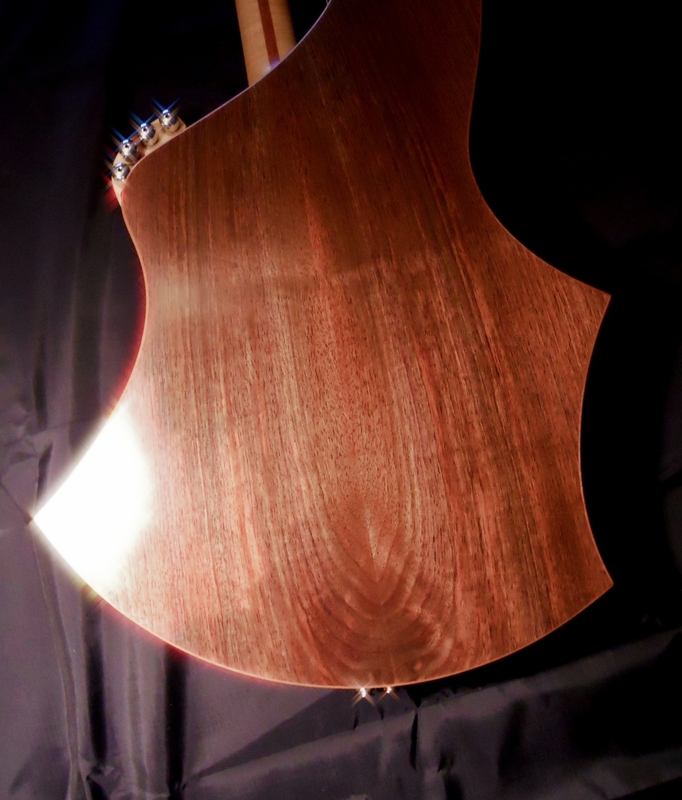 Nathan and fellow Luthier “Tom Waghorn” (http://waghornguitars.com) were also responsible for the design of the internal bracing (a major exercise for this instrument). It was to be above all, an acoustic instrument so components and construction would be kept as light as possible. I obtained Engelmann spruce for the soundboards from Canada as they were able to supply the very large boards required with fine and even grain spacing across the width in superb quality (they were also very helpful!). We decided on an initial batch of four, although the prototype #001 would be constructed and tested before any assembly work took place on the following three. Each would be different with regard to the hardwoods used for the back and sides, with differing laminates for the neck and bindings. As Nathan came to consider that I was only partially insane, I was allowed to assist in some of the woodworking procedures and use of his machine tools, (which displayed greater faith than I probably realised). During the ensuing eighteen months it is fair to say we had a few intense ‘discussions’ and also some bad luck, but we persevered. To build this instrument as a prototype is about as difficult a task as a Luthier could be presented with, even the bridge (which is deliberately a large single moulding) was fiendishly difficult to make the first time. As the work progressed towards the finale, it was like watching a butterfly emerging from the chrysalis of the body mould and the workshop. Once it was complete it was strung up to test its strength, to hear how it sounded and to feel how it played. To be fair, I had actually done stress calculations and Nathan had used his own and Tom`s’ advice and experience so that the machine was structurally very secure. The sound exceeded all expectations. The bass is louder and fuller than any normal acoustic bass; thetreble harp is loud and clear with a tone reminiscent of a Dulcimer whilst the guitar is loud, sweet and balanced. 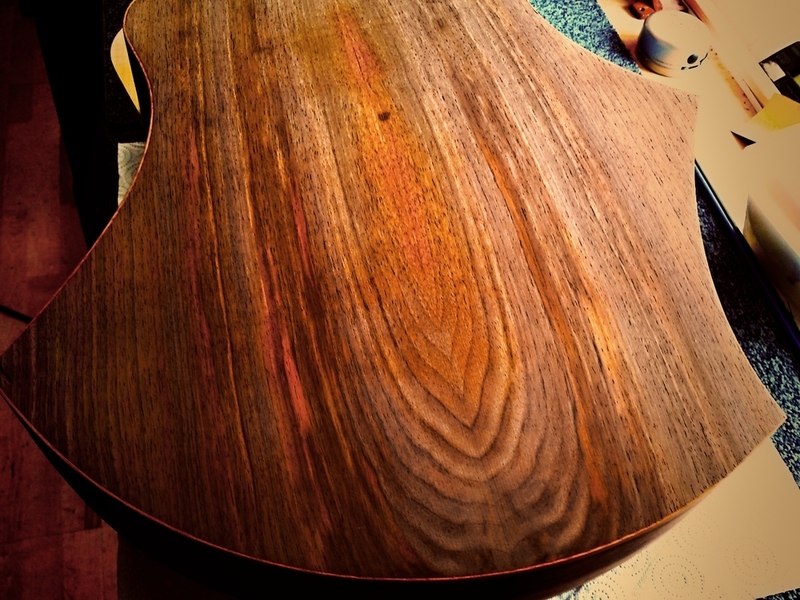 The hardware was then removed and the long process of filling, lacquering and polishing was painstakingly undertaken by Nathan and fellow Luthier Tom Waghorn; who achieved a superb finish. After much experimentation and listening tests we settled on ‘Headway snake’ pickups which were fitted in triplicate, one for each bridge. Each pickup has it’s own pre-amp within the jack socket and each is specifically voiced for bass, guitar, and treble harp. These pickups deliver the true original sound of the instrument with amazing fidelity (click here for sound examples). Following the success of the prototype the design was modified with an improved treble harp headstock. The new headstock is smaller than the original and shaped differently with an offset to allow even large hands full access to the highest fret positions. The machine heads for the treble harp were also upgraded to “Steinberger” mini vertical tuners. These have a ration of 40/1 and allow for very precise treble harp tuning. There is also the option of having “sharpening “or “semi tone” levers fitted to the treble harp.